Everyone possesses spiritual gifts from childhood. Every. Single. Person. But you are born into a world that tells you such things do not exist, and when those gifts are not nurtured, they can become repressed. Some people incorporated that experience as part of their life plan, and so they kept their abilities intact. Others were told that the things they experienced were simply products of an overactive imagination and so they stopped believing in them. Belief is the main mechanism for psychic development, because belief was the mechanism for psychic suppression. Before you can do anything, you must first believe it is possible. Anyone can develop a psychic ability, although certain people seem to be naturally adept at certain skills more so than others. I wrote a previous blog post about how to recognize your intuition, as well as a follow up about how to begin developing those skills. As far as how long it takes? That is entirely dependent upon the individual and how quickly they can find their own groove. 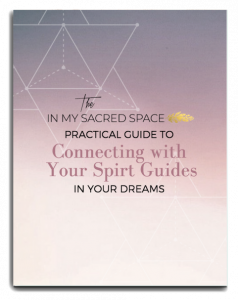 MEETING YOUR SPIRIT GUIDES IS SO EASY, YOU CAN DO IT IN YOUR SLEEP.